As far as I know these Wade Weapons never released, at least here in the good ole US of A. But the appear to have the same color scheme as the Wade 2.0 Playoff shoe from a few years back. I wish I had more pictures but this is the only one I've been able to find. 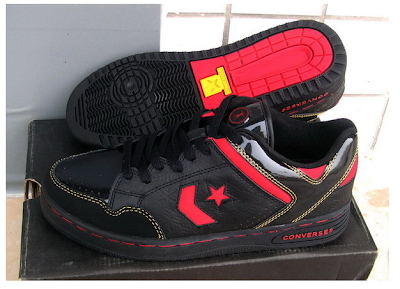 The Yellow and Red stitching really pop with on the black upper. You can also see that the use of black patent is a nice touch. I apologize for a late post today, but I was wrapped up in the Greece vs Argentina game. I'll have more on Team Argentina later on this week. I noticed something very interesting watching this morning, actually three very interesting things. Hopefully I can get some pics, if not I may have to wait until after their next game. Thanks for stopping in and checking out The Converse Blog.